MINNEAPOLIS (AP) — Democratic Sen. Amy Klobuchar of Minnesota says she’s taking her campaign for president and her Midwest sensibilities directly to parts of the region Donald Trump won and that her party wants to recapture in 2020. Klobuchar announced her bid Sunday during a snowy rally along the Mississippi River in Minneapolis, where temperatures were well below freezing. 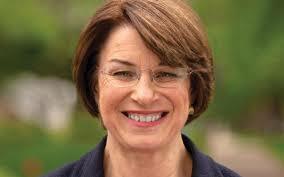 Klobuchar said she would travel next weekend to Iowa then make stops in Wisconsin.